Some plants make you wait. I mentioned the first if the Itoh peonies the other day which took two years to flower but now each have at least half a dozen buds. But at least now they have settled down they will flower every year. The latest splash of colour in the garden is provided by Geranium maderense and although I have waited two years for these to flower too, it spells the end of the plants. They were sown in spring 2013 and planted out after a few months and although a number of plants died, probably of cold, a number have made it through and are now in bloom. 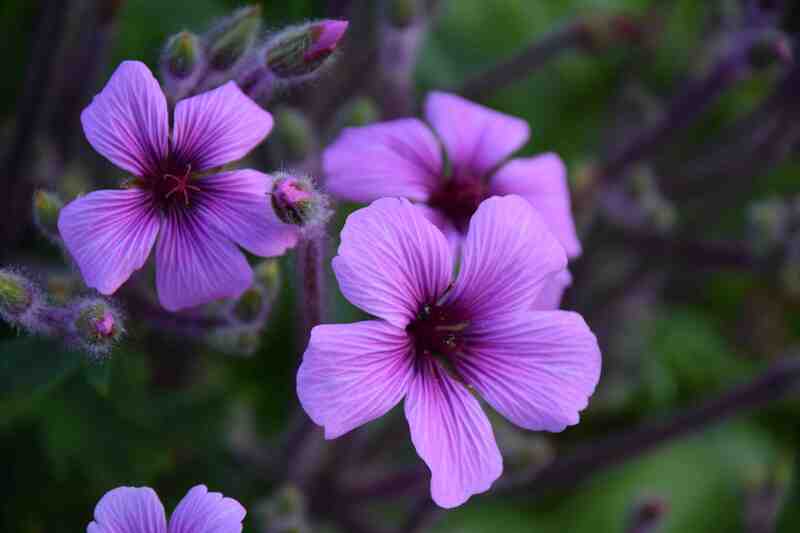 As the name suggests, this plant comes from Madeira where it grows in part shade on north-facing slopes near the sea. It is a classic example of how plants in cultivation can help a plant survive because although hardly common in gardens, since it is not very tolerant of frost, it is well established and not rare. But in the wild there are only about 50 plants (though this must vary because the plant is monocarpic and dies after flowering). According to the IUCN Red List of Threatened Species, it is critically endangered because of lack of habitat through urbanisation and threat by invasive species. It is one of three species that are all from the Atlantic Islands and are superficially similar. 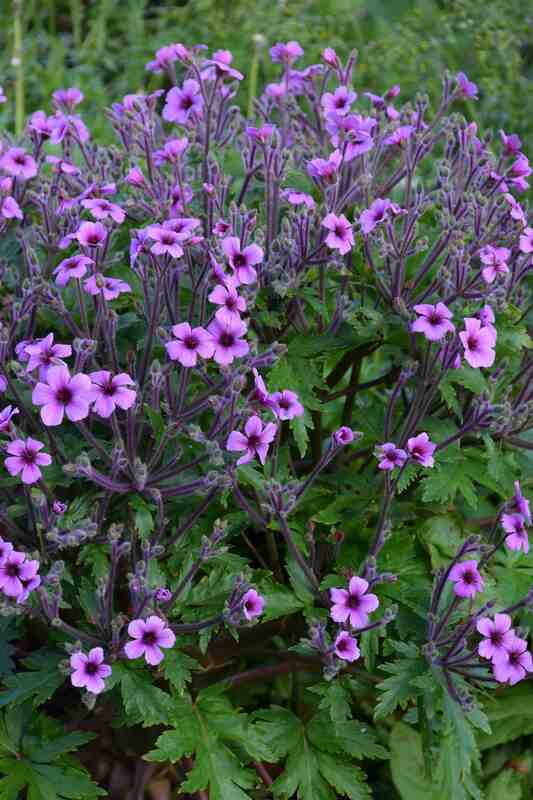 Geranium canariense is different because its flowers are smaller and have narrower petals. But G. maderense and G. palmatum are rather similar. The main differences are that G. maderense is monocarpic and produces a central mound of flowers above the foliage and the leaves are tinted with red. In G. palmatum the plants may flower for many years once they start, with blooms interspersed among the leaves and the plants do not have any red pigment in the leaves. As G. maderense starts to bloom, the large leaves push down against the soil like the struts of a mobile crane, to stablise the plant as it erupts into a mushroom cloud of blooms. Plants can exceed 1m high and wide when in bloom and thousands of flowers open, over many weeks. Cold is the main enemy of this plant though these specimens have survived temperatures down to -5c on many occasions. I would put their survival down to being in a raised bed that is very well drained. It may also explain why they are fairly short in stature compared to what they could achieve. 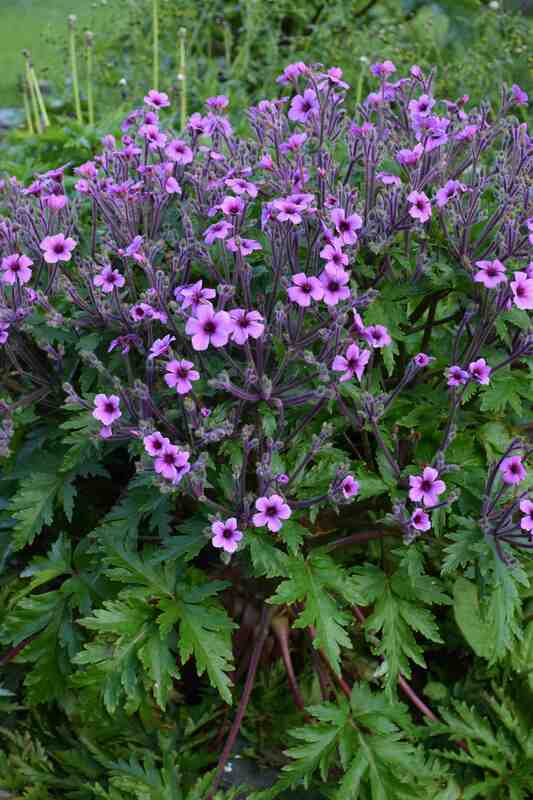 If you have a cold climate it is definitely worth trying this in a pot – I would suggest a loam-based compost and a pot at least 60cm across. Once your plant flowers you will then have masses of seeds and probably lots of seedlings. Although far from it in appearance, the nearest thing we have among the ‘normal’ European flora is G. robertianum, herb Robert and you can see how, in the way that isolated island flora cause gigantic forms of familiar plants, these three ‘monster’ forms evolved. There is at least one white form of the species. ‘Guernsey White’ is a beauty with white blooms, tinted pink in the centre. I appreciate your informative pointers regarding these similar geraniums. I now know mine definitely is not Maderense. It probably is Palmatum. It has been in situ for 2 or 3 years. I think it is the more common one.